A student nurse recently found herself back on the ward where she was looked after as a baby while volunteering for Rainbow Trust Children’s Charity. 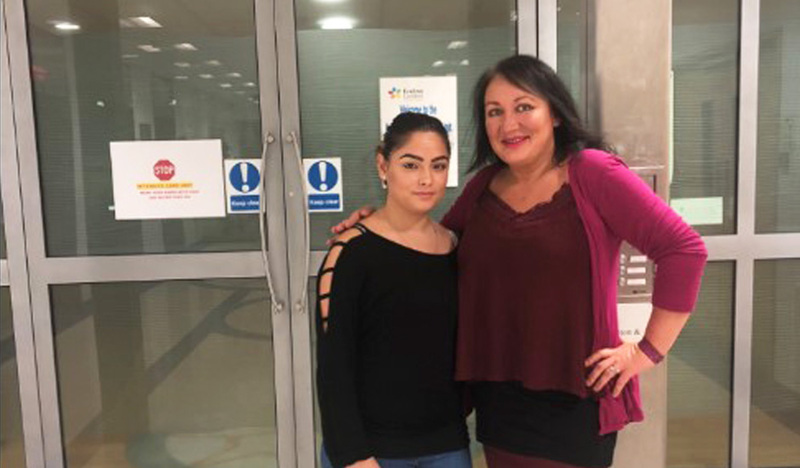 Lia Grafanakis, 21 from Clapham, has been volunteering for a year with Rainbow Trust and was recognised on the neonatal ward at St. Thomas’ Hospital where she spent the first year of her life after being born prematurely at just 25 weeks. Lia is now a healthy young adult and is studying to become a nurse. As part of her course at Middlesex University, Lia was required to complete a work placement. She chose Rainbow Trust because of its work with families and a personal connection through a friend. “My experiences in the early part of my life did motivate me to volunteer.” Lia said. The Family Support Worker, Vilja, who Lia was working with was aware of the connection and encouraged her to talk to staff. “I approached them and told them my name. They remembered me and my family! I spoke to them both and took pictures with them, it was incredible.” Lia said. Lia’s Grandfather sadly passed away while she was still a baby. Funds were raised at his funeral which were donated to St. Thomas’ and used to buy a machine to support the neonatal ward. Lia learned that the equipment is still at the hospital, although due to its now advanced age is no longer used regularly. Lia and her Grandfather’s names remain on the machine, memorialising the little girl’s brave fight and her Grandfather’s love. “Some of the kids I’ll be seeing as a nurse may have life threatening conditions. Volunteering with Rainbow Trust will definitely help me understand and cope with these situations. It helps me get a grasp of how the family are feeling because you see behind the scenes. I’m not only with them at hospital, but at home too, and gives me a different perspective.” Lia said. Rainbow Trust has eight care teams of Family Support Workers across nine locations in England, including two in London. “Volunteering was supposed to just be a short-term thing for uni, but I’m enjoying it so much I’ve asked if I can stay on.” Lia said. If you would like to volunteering with us, chceck out our current opportunities here.